I'm actually really stoked about epic again and excited every time I go out to paint. I'd like to finish the buildings very soon, but I'm still working on our new apartment which we moved into i December. So hobby time is a bit scarce but should open op come February. Finishing the apartment also means I can take stuff home, have a little paint station but no desk at the moment. The new place also has plenty of storage of a detachable table, which is my main project for the Spring. Thanks for looking and all the comments! I got back into my TS army this evening, revived a 2 year old idea. The large disc is 40mm across, the middle one 30 and the small one roughly 20. The tubes beside wil eventually go on the top side, the height for the large one wil be 50-60mm scaling down for the smaller discs. 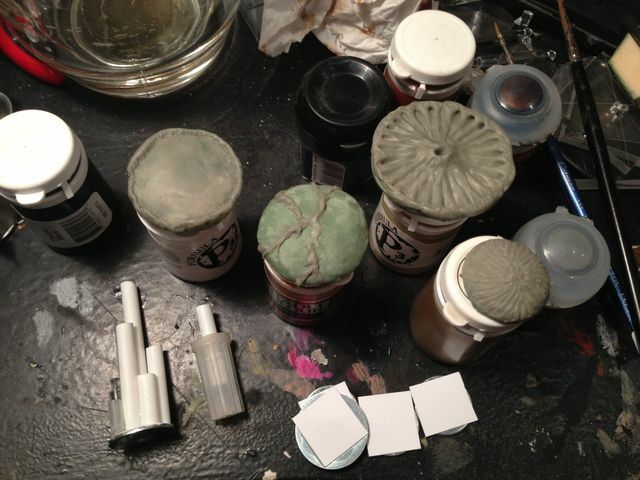 These saucer types things will be completely scratchbuilt and could be cast up to make dozens for my army. Ok, time to revitalize my epic interest! 2014 will be the year I finish my Thousand Sons, honest!!! Where did you get those polystyrene buildings? Those look great. Looking forward to more Thousand Sons!